“For months no one was able to tell us why our Rinki’s neck was so painfully swollen. She couldn’t open her mouth to eat or even speak. She couldn’t move her head for days. We went from one hospital to another, desperately trying to find a way to ease the pain. The medicines didn’t work. We’ve stood in lines for hours at hospitals, only to be disappointed. 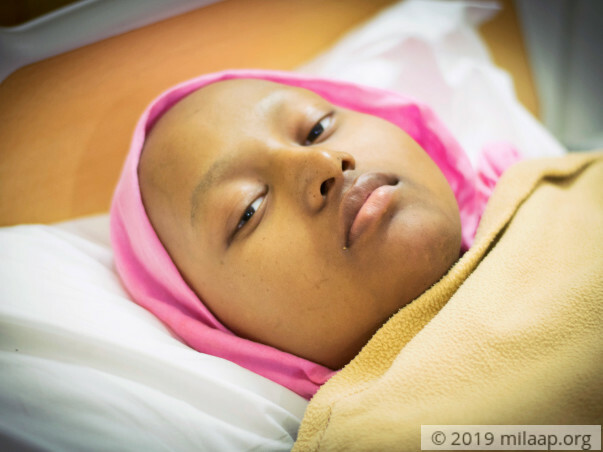 It was only in August last year that we found out Rinki has a deadly form of bone cancer.” - Mukti, Rinki's mother. 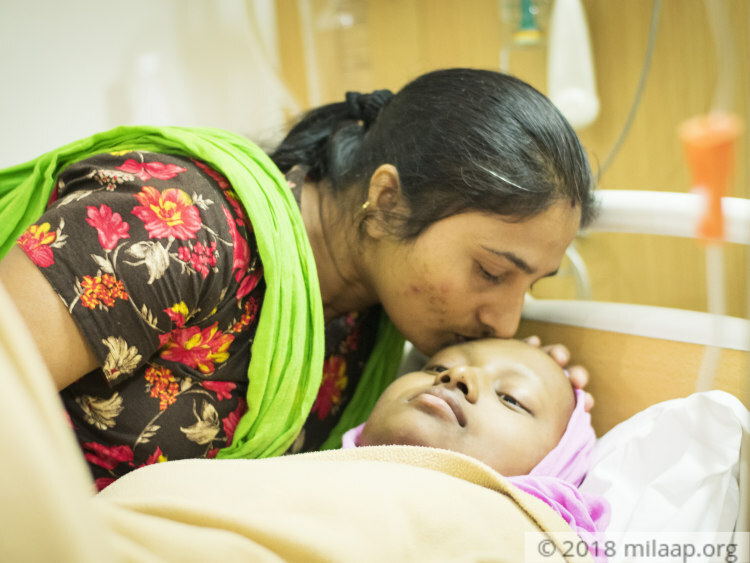 Rinki’s parents told her that she must stay in a hospital in Calcutta, far away from home and her school to get treated for an infection. Rinki took all her school books and her favorite novels with her. Now, as she gets chemotherapy, she reads her books to distract herself from the severe pain of cancer. After months of chemotherapy, Mukti and Bhagwant are at the end of their wits and money. They have nothing left to continue the treatment that will save their daughter’s life. 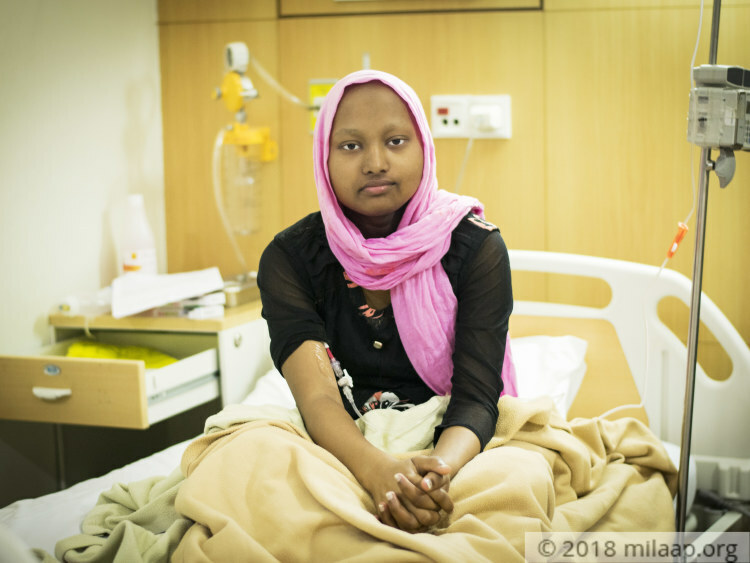 Cancer has not only made Rinki physically weak, but she’s no longer the cheerful and bubbly girl her parents and siblings knew. Rinki now mostly keeps to herself. The day she found out she has cancer, she broke down, but quickly wiped her tears and told her parents “I’ll be fine and we all go back home together. Don’t worry about me, I will come back home.” Unfortunately, Rinki doesn’t know the financial hurdle her parents are struggling to overcome. She doesn’t know that without treatment, she won’t make it. Rinki was immediately started on chemotherapy. She has completed 9 cycles of chemotherapy so far, but her fight isn’t over. She needs 5 more cycles of chemotherapy, but her parents are struggling. Bhagwant works as a farmer in Lucknow and shuffles between his hometown and Calcutta to meet Rinki every few weeks. He hardly earns Rs. 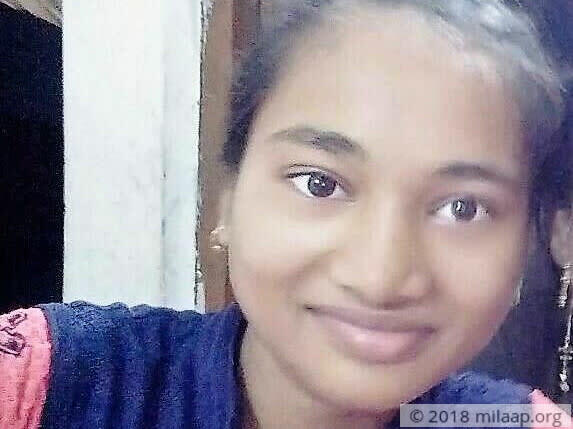 200 per day, and after spending nearly 12 lakhs on her treatment so far, Bhagwant and Mukti have little left to call their own. 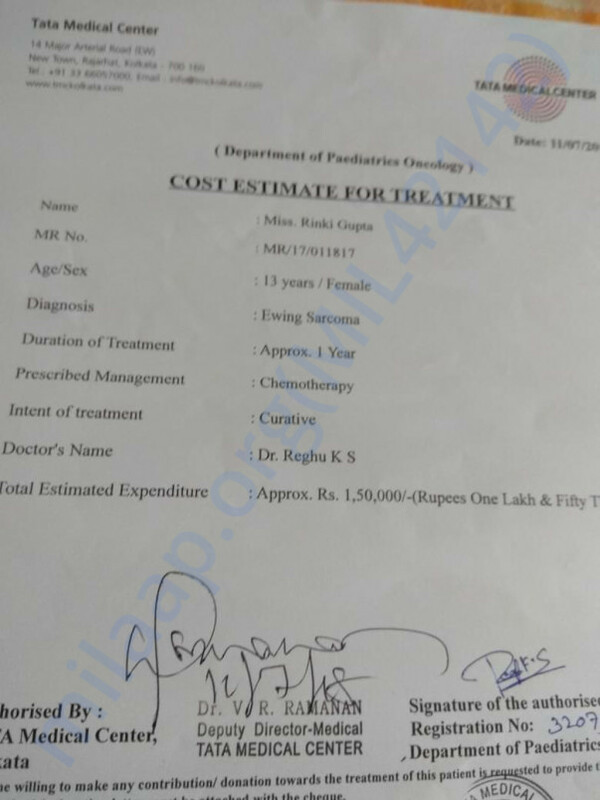 Rinki needs 1.5 lakhs to complete her chemotherapy treatment and finally beat cancer. She has been living with the dreadful disease for over a year now and only chemotherapy can save her. Bhagwant and Mukti are desperate to save their daughter’s life, but they’re helpless. Rinki needs your help to fight cancer. Your support will save Rinki’s life. Click here to save 13-year-old Rinki. Here's a quick update on Rinki. Rinki is doing well now, she has completed all her chemotherapy cycles and now has to undergo an MRI scan along with a few routine check ups. Thank you all for the support shown towards her. Rinki underwent her last chemotherapy on 25th September, her next one is scheduled to happen on the 16th. She is responding to the treatment and is doing well. Please keep sharing the campaign with your friends and family and thank you for the support shown so far. Here's a quick update on Rinki. Rinki is currently ok and is responding to the treatment. Rinki will be undergoing chemotherapy tomorrow. Thank you once again. Will keep you posted on the progress. Please keep praying and supporting.